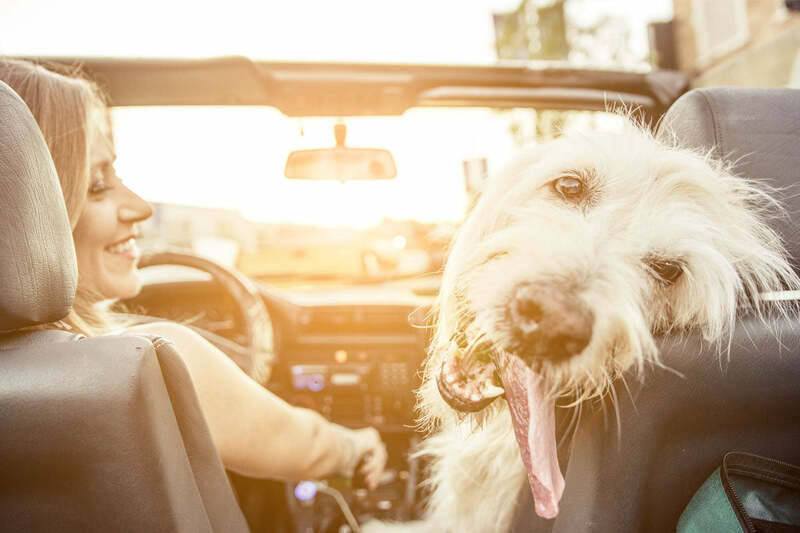 Planning a road trip with your furry best friend in tow? Before you hit the road, here are 4 tips to ensure happy, stress-free travels … for all of you! If your pet normally gets to ride shotgun or sit in the backseat with the breeze blowing on his face, he might not be totally on board with a travel crate at first. BUT … it is the safest way to travel (for you AND your pet). It’s also a great way to make sure your pet stays out of trouble at the hotel or your host’s home. Keep in mind, the crate might bother YOU more than it does your dog. So keep it positive at all times, as your intuitive pet can pick up on your feelings. Choose a crate that’s well-ventilated and large enough for your pet to stand, sit and lie down in. Secure it properly so it’s not bouncing around when you take on a big pothole. Make sure your dog is well exercised before he goes in the crate. If he’s tuckered out, he’ll be more likely to rest. Remove your pet’s collar, as it could snag and pose a choking hazard. Get your pet used to the crate before the big trip. Don’t force him into it. Put a treat inside and let your pet enter on his own. Then close the door and walk away (no sad “it’ll be ok” voice … remember, keep it positive!) Come back in 15 minutes. This will ease your dog’s separation anxiety next time you crate him. If your dog isn’t used to travel, start taking him on short rides a few weeks to a month before the big day. Now isn’t the time to be spontaneous. When you plan ahead for pet travel, you can avoid headaches and possible heartache should your pet wander off and get lost. Make sure your pet’s ID tags are up-to-date. Call the vet to make sure your pet is current on all vaccinations. If you’ve never done so, consider microchipping your pet for easy identification. Instruct the kids that traveling is a big deal for Fido … and to refrain from teasing or riling him up when he’s in the car. Research pet-friendly hotels before you leave. Request a lower floor, as it will be a lot easier to get your pet in and out of the hotel without incident. Don’t leave home without these must-pack travel items! Your pet’s rabies vaccination record … if you’re traveling across state lines, this may be required. Food, bowls, leash, waste scooper-upper, plastic bags, pet first aid kit, and any medications or grooming supplies you might need. 4. Pass on Gas … and Other Tummy Troubles. If you travel with kids, you already know how bad those smells from the backseat can be. How can you keep your pet from joining in on the “fun”? Stick to your pet’s regular dog food. While it may be tempting to sneak your pet some of your burger and fries, it may not end well. Bring bottled water for your pet to drink (drinking water from an area your pet isn’t used to can cause stomach upset.) The stress of travel can make your pet thirstier than normal, so be sure to keep your dog well hydrated.